My point is: my Southern roots go back to before the U.S. became a country. We came early to this party and we stayed late. Which gives me the right to comment on this whole “Romance of the South/ Up with the Confederacy” CRAP coming up through the drains these days, poisoning our public discourse with pure vituperative nonsense. Any student of American history knows that the United States was founded on a fault line – slavery – and that it was only a matter of time before tectonic plates shifted and the nation was rent asunder. A civil war was in the cards from Day One. In fact, pace Tea Party, it’s arguable that the Second Amendment had a lot more to do with assuring Southern whites that they would be able to surpress a slave rebellion than it did with ensuring that patriots could defend themselves from some nonspecific tyranny. It still does. “Don’t want too many of them brown people getting up in our white business, after all.” Isn’t that what you believe? And here’s the kicker, those of you just a-longing for those good old days upon the Swanee River, for most of you that will be a case of nostalgie de la boue. Because you descend from Crackers. Yes, Crackers. 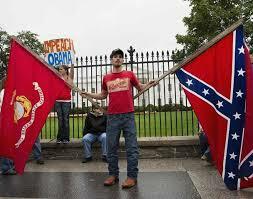 All of you who are so proud to call yourselves ‘Rednecks’? Crackers. Tenant farmers. Dirt Farmers. Poor white trash. You know how to tell? Do you have a great grandmother who belonged to the Daughters of the Confederacy? Is your daughter eligible to be a debutante in North Carolina or Georgia or Mississippi? No? I thought so. Crackers. And your relatives probably didn’t either, so stop dreaming! When I was twelve years old, I read Margaret Mitchell’s Gone With the Wind for the first time. Then I read it four more times. I loved it. I fell for it hook, line and sinker. For a number of years it informed my view of the Civil War and the history of the United States and my own identity as a Southern woman. Excuse me. As a flower of Southern Womanhood. So don’t save your Confederate money, boys. The South will not rise again. And you are not who you think you are and never will be. So just get over it. And, while you’re at it, learn to spell.